I have never seen a name show up on a phone call to MJ, ever. I think if you can manage contacts that it probably would, but not a chance from the service on it's own to me. I use MJ+. I can verify that I also get Caller ID with Name, but only about 10% of the time. My question would be - is that something "pushed" by the callers phone company? OR, do the MJ servers sometimes bring it through? This is not (and never has been) an anomaly of any sort. The VOIP headers carry the CNAM across the network to nearly all other providers. When you see the Caller ID NAME show up, it's a 99% probability that you are receiving a call from another VOIP service/user. I have been sending out and receiving Caller ID with NAME for several years. Any MagicJack (or the like) that calls me and sends the name will be displayed on my end. The same goes for the reverse. Posted: Mon Apr 07, 2014 12:26 am Post subject: Welcome Admiral!!! for your first 3 posts to the forum, some GREAT knowledge and expertise not seen in a long time...WELCOME ABOARD!!!!!!!!!!! Posted: Mon Apr 07, 2014 1:54 am Post subject: Re: Welcome Admiral!!! - REGARDLESS, caller id with name is coming through on my MJ+. I never said it was not coming through on your CID. If you dislike MJ so much, why do you still use it? I do not. off course, it took a while till the subscriptions expired, but now it is over. Here is why I am still posting: MJ very successfully flooded the country with it's misleading propaganda.That steals business from better, far more honest providers and at the same time gives VOIP a bad name because a lot of people who went through MJ experience now think that ALL VOIP is as miserable and crooked. Bad for us. On the top of it, this is not an official MJ forum. If it were, I would not bother. It's " independence" gives it a dangerous level of credibility especially since just about the only people left here are the fan boys. 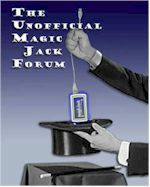 I honestly wish Magic Jack would officially take over this forum. But I guess they know why they do not. I replaced my biz line @$62/month with a MagicJack and save $724/year. What's the actual downside? No Fax. Fax? What's that. The only downside is that I have to use my cell when the internet is down. Frankly, you're a fool if you pay for a phone line. Telephone companies have been ripping off businesses since day 1. You're paying all kinds of hidden taxes, ancient surcharges that never go away. There is no argument against MJ if you have a good internet connection. Of course if you buy DSL you're dealing with the phone company, so your milage will be lousy. I see posts from Cell14 about magicjack. I don't like magicjack either, but it is cheap and I will put up with it for the price. However, posts say the game has changed and there are others out there nearly as cheap. Personally I would give up my land line if not for my wife. She insists on keeping it. However, I am going to pay as little as possible. I will pay a bit more for better service, but not 10 times as much. Can you provide more info? The cheapest I see is about $20 per month. That is still way over what MJ charges. GV still requires you to have a phone, so it does not replace your land line. Tell me who else can I use to have a VOIP landline in my house that is close to the price of MJ with better service? I do not get the caller name with my caller ID. It probably depends on where you live or maybe how you are getting your VOIP signal. MagicJack does not provide caller name just phone number.